The Greater Richmond Region has won the distinction of being one of the Best Intergenerational Communities for 2015! This prestigious award of the Metlife Foundation / Generations United heightens awareness of the importance of intergenerational solidarity in building strong, healthy, supportive communities for all ages. “We congratulate Greater Richmond, VA on being a winner. It takes a great deal of effort and forward thinking to create a community where members of every generation thrive and want to live,” notes Donna Butts, executive director of Generations United. Greater Richmond is an area rich with traditions, culture, history and geography. With over 40 local intergenerational programs, festivals, events and leisure activities, bringing together our 1 million- plus residents, Richmond thrives off meaningful connections between older adults and youth. A community jewel is our James River Park System, 600 protected acres of shoreline and river islands running through the community. This physical environment is an organic forum for recreation and active living blending together different generations that learn from one another. CATCH Healthy Habits a national evidence-based program hosted by Senior Connections, The Capital Area Agency on Aging and Virginia Commonwealth University Department of Gerontology. Adult volunteers teach K-5 students the value of healthy eating and physical activity in an effort to combat obesity and instill lifelong values. This past year, over 150 youth were educated at five sites, 20- plus adults volunteered and 30-plus older adults engaged in our work. Programs like CATCH Healthy Habits and others stem from Greater Richmond’s intergenerational roots, going back to 1984, when Westminster Canterbury Richmond became an intergenerational shared site after including a Child Development Center with its Continuing Care Retirement Community. CATCH Healthy Habits is a Generations United 2015 Program of Distinction re-designee that was first honored in 2012. Youth and older adults also engage through the YMCA of Greater Richmond’s Growing Younger program, an initiative of United Way of Greater Richmond & Petersburg (GRP) in partnership with Senior Connections’ Friendship Cafes. The YMCA of Greater Richmond is known for having a natural convening space with multiple locations across the region. The program engages seniors in physical activity, healthy movements and the arts. Chesterfield County’s F.U.N.- Families Understanding Numbers is a financial literacy program targeting grandparents and grandchildren. The program is designed to help grandfamilies make the most of their finances. Participants learn how to reduce debt, protect your retirement, plan for the future and advocate for yourself as a consumer. This program is offered in partnership between Chesterfield libraries and the Senior Advocate’s Office. PALETTE (Promoting Art for Life Enrichment Through Transgenerational Engagement) was launched in Richmond, VA in January 2014. Through this intergenerational art program, active older adults are paired with interdisciplinary undergraduate and graduate students to participate in creative arts activities. Over the course of 14 weeks, participants attend visual art classes and cultural outings; students attend educational seminars. These experiences provide an opportunity to meaningfully engage in creative activities as a way to find common ground with other generations. All of these programs make our region award-worthy! The application for this Intergenerational Communities Award was spearheaded by the Greater Richmond Age Wave coalition and supported by various community partners, highlighting the significant work of: AARP, Chesterfield County, Family Lifeline, PALETTE, Richmond Regional Planning District Commission, Senior Connections, The Capital Area Agency on Aging, Sports Backers, United Way of Greater Richmond & Petersburg, Virginia Commonwealth University, Westminster Canterbury, William Fox Elementary School, YMCA of Greater Richmond and many others. The Greater Richmond Region looks forward to continuing to celebrating all ages and this award with other communities across the country. Presentation of this year’s 2015 Best Intergenerational Community awards will occur on February 11 on Capitol Hill in Washington, DC. 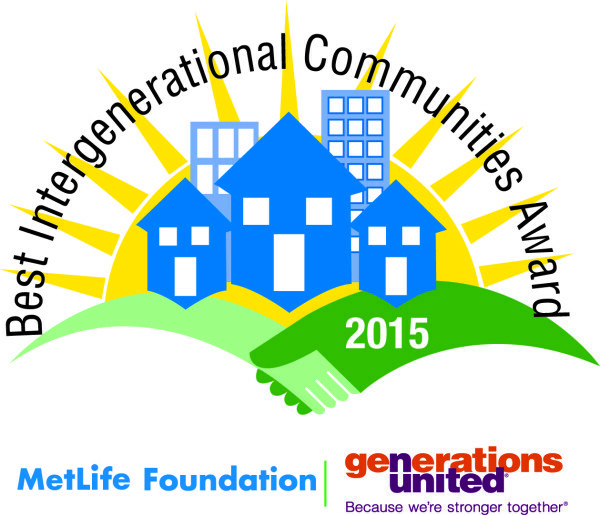 The Best Intergenerational Communities awards program is made possible with a grant from MetLife Foundation. We are very proud Richmond has been selected.